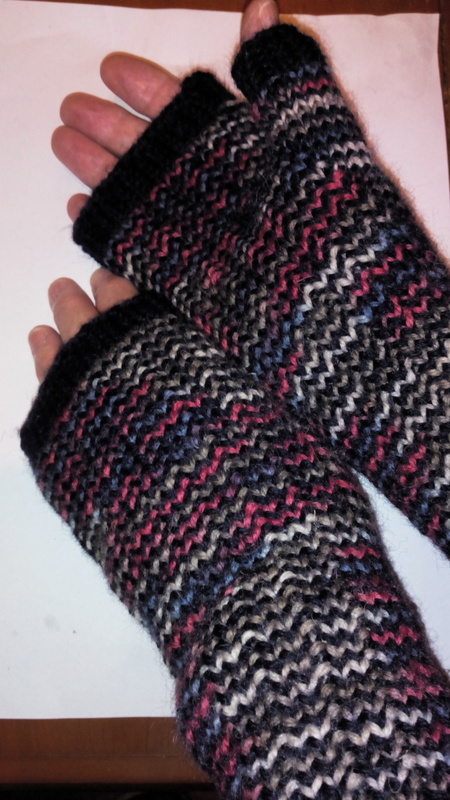 That cold Easter Monday I mentioned and the “now I have some of my own” Murano mitts to which I alluded? Uuh, yeah, it was genuinely cold and neither Dr B nor I could get warm. We were both doing some computer work. 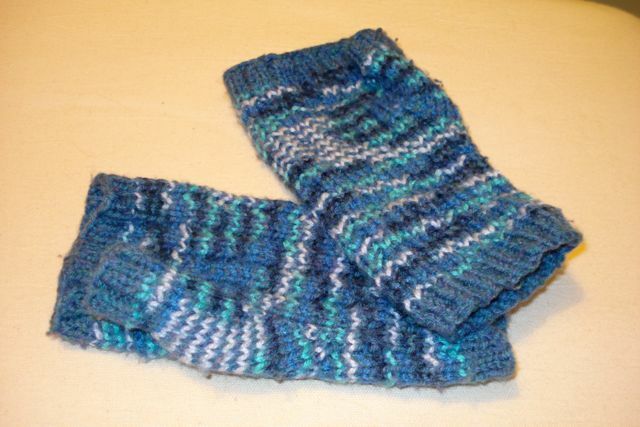 He reached for the colourful mitts I’d made him using Jester yarn (Ravelled but not yet blogged). Me? Well, I pinched some. 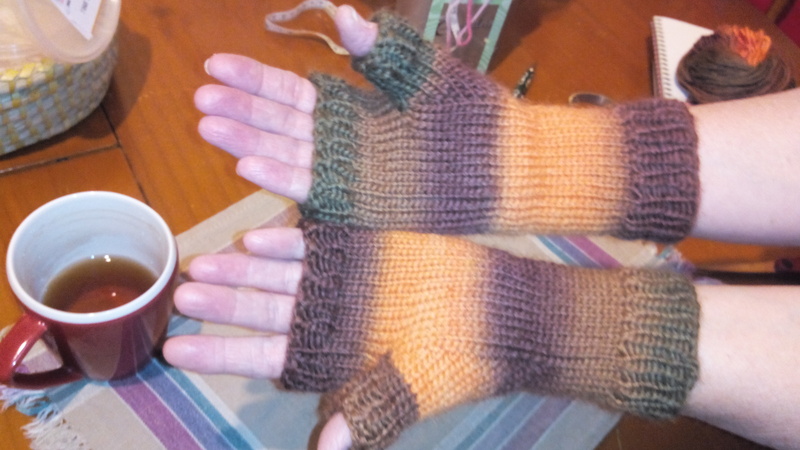 Over the years, I’ve made something like 15 pairs of fingerless mitts for other people and some for myself that have ended up being given away. These weren’t meant to be mine. I made them for someone else. But, as they were meant to be a surprise, the intended recipient won’t know I’ve pinched them. And I really, truly can and will make her another pair. In the meantime, I have warm, comfortable fingers while I type and, believe me, that’s a first 🙂 Bendigo’s Murano to the fore again, this time in a lovely shades-of-purple colourway (it looks blue but it’s definitely purple). 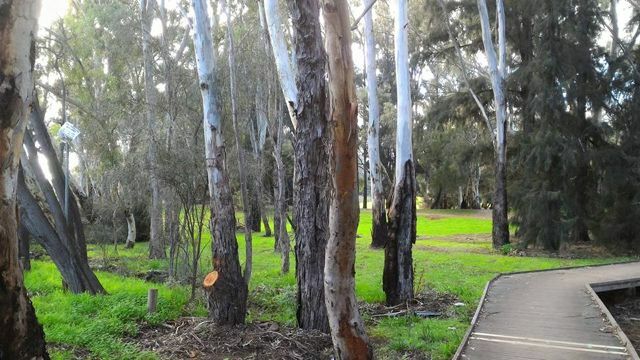 Given the combination of unfriendly weather and a public holiday, if you had fingerless mitts with a looming deadline, wouldn’t you have stoked them up while watching La Terra Trema? (Not the best choice, because I really needed to read the subtitles!) 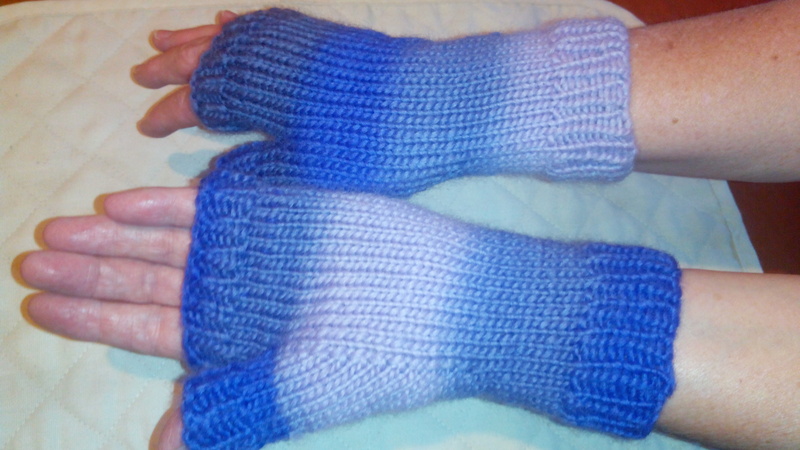 I did and made one mitt. 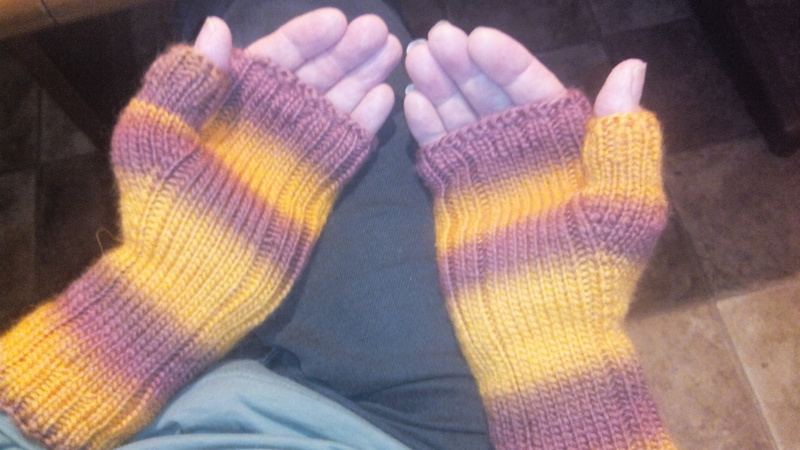 This afternoon I’ve knitted the second one to the point where all I have to do is 10 very short rows on that second thumb. Nothing to it. Then it’s on with the blocking and Eldest Niece should have them for her birthday. Once again, I’m using Bendigo Woollen Mills’ Murano yarn, this time leftovers from the beanie I made for Dr C way back when. 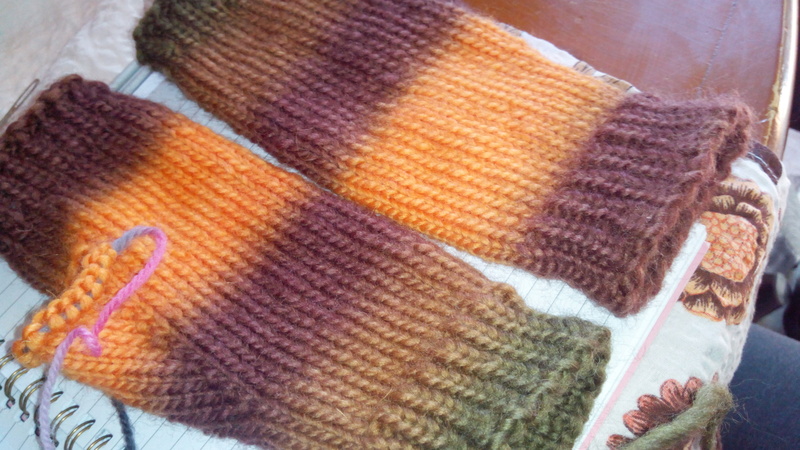 It’s perhaps not the best yarn for something like this, in the sense that it has a tendency to felt and it pills something dreadful after a few wears – meaning that it might not be as long-lasting as a harder-wearing yarn like Cleckheaton’s Country Tartan – but the colourways are such fun and the resulting mitts certainly very warm (I finally have some for myself). The next question is, should I make a shopping bag to accompany them or just gift-wrap them in paper instead?